Its main objectives are to increase its students’ knowledge and understanding in all aspects of human resources management. The Human Capital Management Society (HCMS) is a Human Resource professional body operating under the auspices of the Hong Kong Management Association. HCMS aims to be the leading professional society advocating human capital management excellence in Hong Kong and the Region. 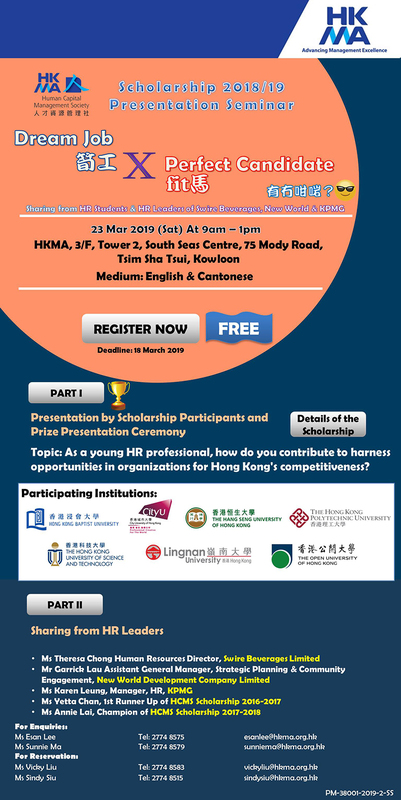 HCMS Membership is open to all persons who are members of the Hong Kong Management Association and are executives involve Human resources management (HRM) , instructors in HRM in educational institutions or students studying HRM courses.